Please read the official homeowner pre-application for the complete and legal details. Must prove your need for housing. Must have 1 year prior residency in Pike County. The maximum allowable annual income is $50,000 for a family of four. The minimum annual income is $40,000 for a family of four. Must be able to make a small down payment at closing (estimated to be $2,000). Must give written permission for a complete check of all family assets, income, credit and debts and to allow HFHPC to obtain verification of all needed information. Must be willing to participate in Habitat programs designed to aid families in such areas as budgeting and home maintenance. 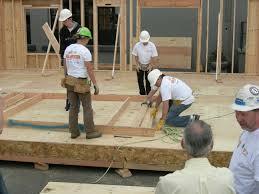 Families must commit to a minimum of 400 hours of sweat equity to be completed prior to occupancy. A minimum of 200 hours by family members(s) designated as the applicant. The other 200 hours may be provided by other family members, relatives or friends. The family selected as most qualified will be offered the agreed upon home or construction at cost and a 30 year, zero interest mortgage will be transacted. Volunteers are an integral part of every aspect of Habitat’s mission. In addition to working at the building site, volunteers are needed to help with publicity, fund raising and special projects, etc. There is no such thing as unskilled. If you come to us we will find a job for you. After a few times of volunteering with us, the majority of volunteers are “hooked” and enjoy being known as Habitat volunteers. Volunteers must be over 16.